When it’s cold outside, we are often making a hearty soup. Soup warms a person up like nothing else can and it’s usually very inexpensive to make. 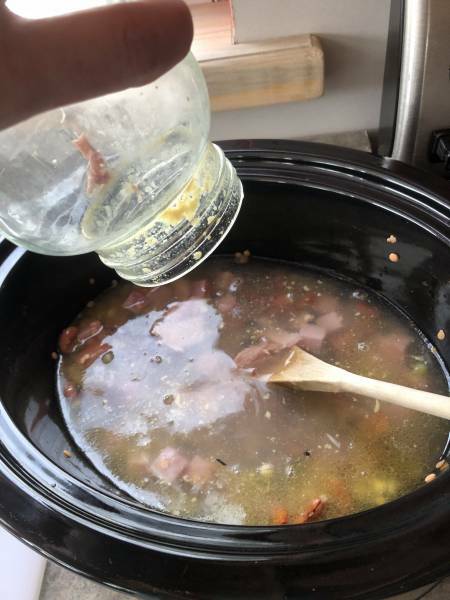 We love this Ham and Bean Slow Cooker Soup! January and February are always low spend months here for us. 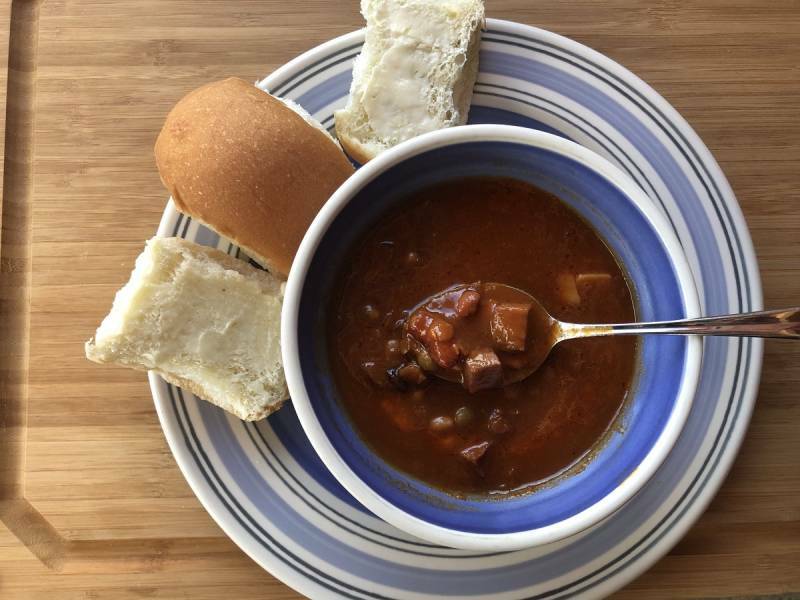 A slow cooker full of healthy hearty soup is a perfect way to have a cheap but filling meal. Start by soaking the dried beans in water (to cover) for 12 hours. I put my beans in water after we eat dinner, then set them in the fridge overnight. Then rinse them well and set aside. 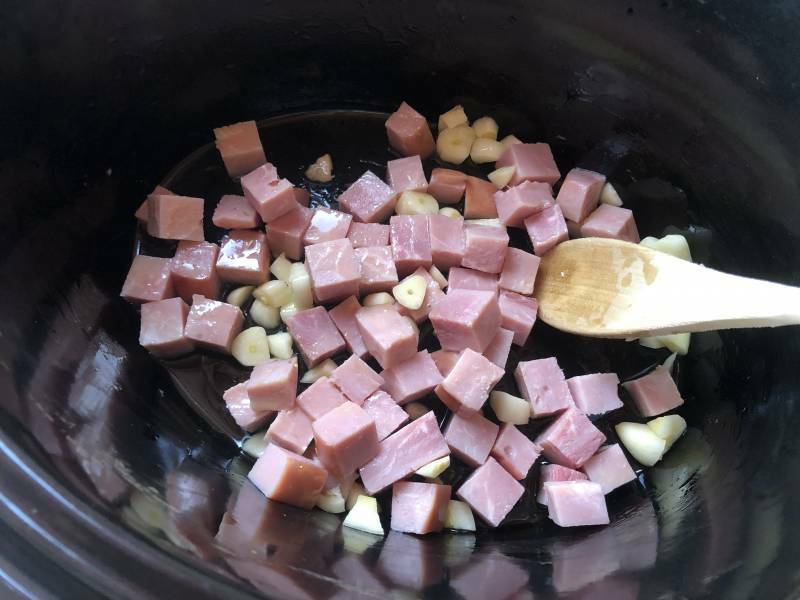 Start your soup by dicing the ham steak into pieces. Make them as small or big as you like. Small kids? 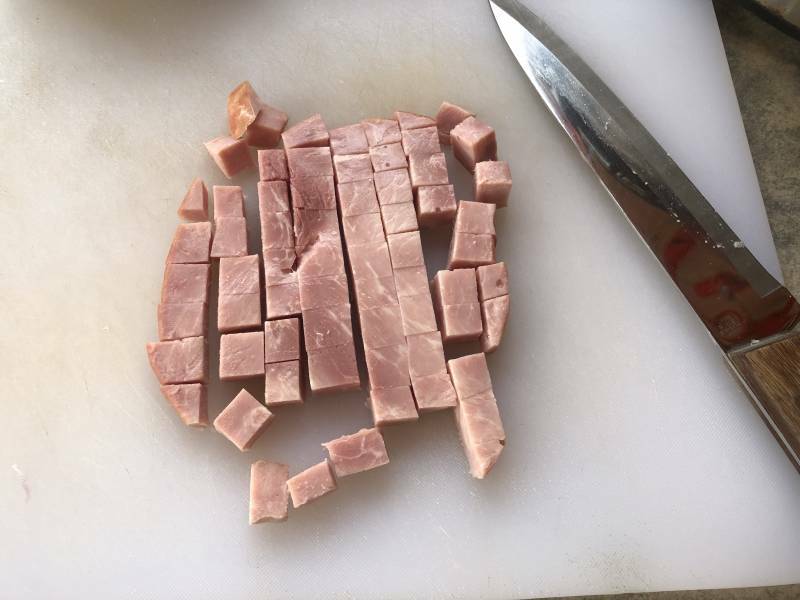 Cut the pieces small. Just for hungry adults? Dice the pieces larger. Turn your crock pot (or slow cooker, whatever you call it) onto high. Drizzle a tablespoon or two of olive oil on the bottom. Dice the peeled garlic cloves and toss them in. Let it all cook about 30 minutes. Add your rinsed and drained beans. 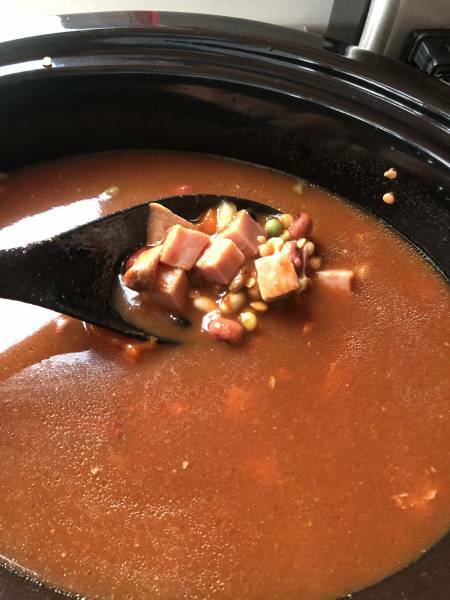 You can use premixed soup mix or a 9 bean mix like I got from Costco. Now add 1 quart of chicken broth. Stir well. In goes 2 pint jars of homemade tomato sauce. This is going to add a wonderful hearty flavour, especially along with the chicken broth. Stir well and leave to cook. Heading off to work for the day? 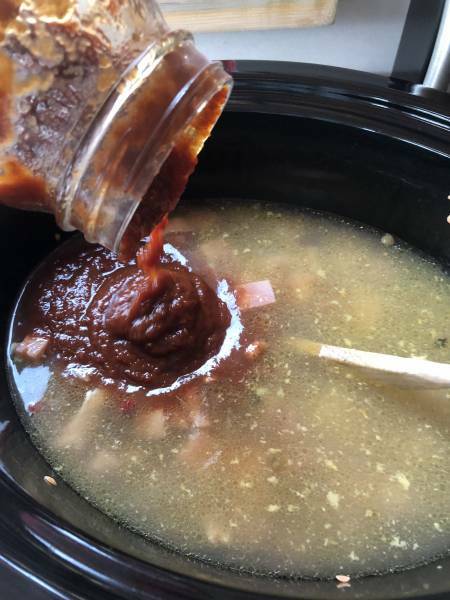 Turn your slow cooker down to Low before you go. If you are around, give it a good stir every couple hours. Or not….it doesn’t matter! Six or eight hours later, here’s the finished result. If it stays in the crock pot longer, that’s fine. There is nothing finicky about this recipe. Which is what makes it so easy! It’s so nice to come home at the end of the day and dinner is ready, right? Serves 6 people easily along with buns and a side salad. Have more people to feed? Add water or chicken stock and another can of tomato sauce. Got leftovers? Transfer the soup into a smaller container and pop in the fridge. Or, put it in a freezer container for a super easy, ready to heat meal for another busy day. A super healthy and hearty soup. 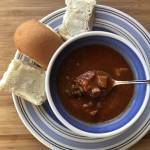 Great for a family or a crowd and easy to make in your slow cooker or crock pot. 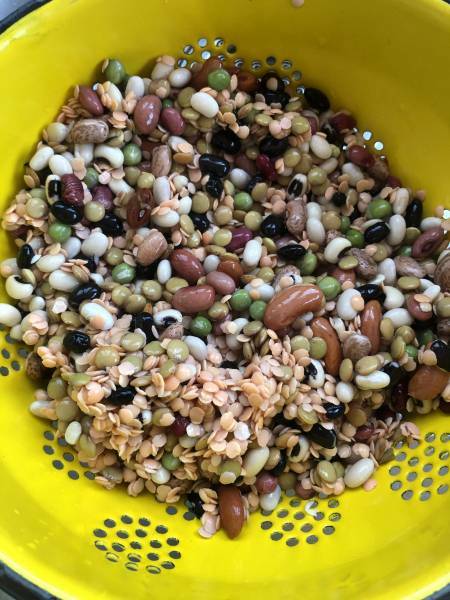 Put dried beans into a large bowl. Cover with water and let sit for 12 hours. Rinse well and drain before using. Turn slow cooker onto High, add the olive oil. Stir well to coat with oil and let cook for about 20 minutes. Add tomato sauce and stir well. You can add almost anything you like to this soup. Skip the tomato sauce and have the soup with the chicken broth base. Or don’t add the tomato sauce until after your first meal! When you reheat the leftover soup, then add the tomato sauce. You will be changing up the entire flavour of the meal. Add diced celery, carrots or any other vegetables you like. The variety is endless and only depends on what you have in your fridge or cupboard at the time. 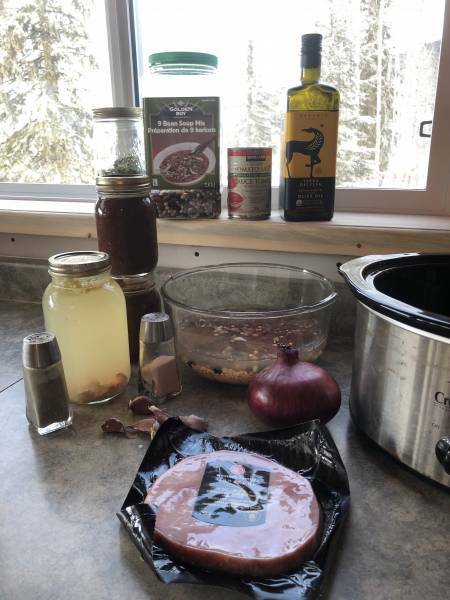 Want to read more of Country Living in a Cariboo Valley’s Recipes? You can find them all right here.